ELA.RL.3.3: Describe characters in a story (e.g., their traits, motivations, or feelings) and explain how their actions contribute to the sequence of events. ELA.RL.3.4: Determine the meaning of words and phrases as they are used in a text, distinguishing literal from non-literal language. ELA.RL.3.10: By the end of the year, read and comprehend literature, including stories, dramas, and poetry, at the high end of the grades 2-3 text complexity band independently and proficiently. ELA.RI.3.4: Determine the meaning of general academic and domain-specific words and phrases in a text relevant to a grade 3 topic or subject area. ELA.RI.3.9: Compare and contrast the most important points and key details presented in two texts on the same topic. ELA.RI.3.7: Use information gained from illustrations (e.g., maps, photographs) and the words in a text to demonstrate understanding of the text (e.g., where, when, why, and how key events occur). 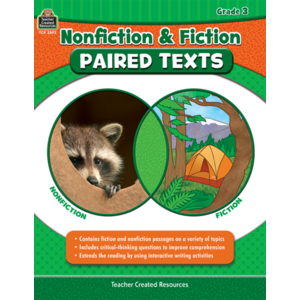 ELA.RI.3.10: By the end of the year, read and comprehend informational texts, including history/social studies, science, and technical texts, at the high end of the grades 2–3 text complexity band independently and proficiently. ELA.W.3.10: Write routinely over extended time frames (time for research, reflection, and revision) and shorter time frames (a single sitting or a day or two) for a range of discipline-specific tasks, purposes, and audiences.